I sat next to this awesome French guy last week. As we ate my Roasted Chicken with Lemons and Winter Root Vegetables, I took note of a spot of cheese standing solo on the edge of his plate. Now I bought that fancy cheese because he and his prominent food family and friends were coming for a special meal here at Annadel. Since I’m still learning about food and cheese and wines, I let in a pause of insecurity. 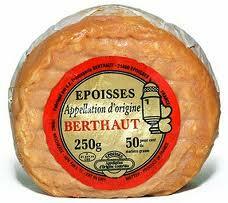 I wondered if this cheese I bought and served was too “something” for a fancy French foodie? But our guests were just so lovely that my lame little thought vanished. THEN We moved on to baby Kale and Arugula Salad with mustard vinaigrette… My lunch date served himself a healthy heap of greens. And only then did he move the cheese. Into position. Jerome F. next did something so completely fresh, to me at least, that I stopped mid-bite to watch him. He used his knife and fork to slice thin slabs of this delicious cheese onto speared dark leafy greens and ate it. From his fork. All together. I tried not to stare. How have I never done this?? 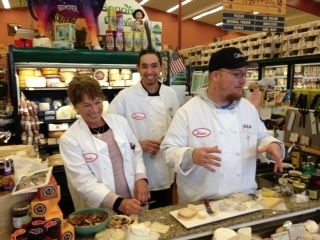 We love our cheese around here (sans the crackers) and fancy butters too (revelation ca. 2011). Sure I’ve crumbled the blue and goat cheese over salads for years. But this? An Epoisses de Bourgonge — one of the more wonderfully feral French cheeses I’ve had to date — paired with… baby KALE? 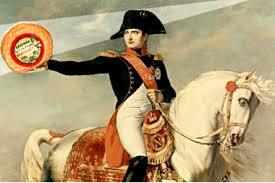 Couldn’t resist this web image…! Was he crazy or just so super cool, awesome food guy? Since he is one of the more respected Chefs anywhere, let alone France, I chose the latter. So I copied him. Born anew! 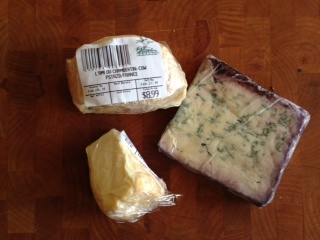 I went to my trusty cheesemongers at Oliver’s and spent 1/8 of our weekly grocery funds on cheese and kale. With some asparagus and artichokes for extra flavor too. Dean thinks I’m nuts. I’m hooked. We chose a yummy blue cheese washed in red wine, an incredible Chambertin, and a Soumaintrain from a huge array of options… At least that’s what the labels tell me. I’m sure there is some proper types of cheese to pair with greens but here’s the thing, so far they all taste great to me. Cow, goat, blue, pasturized or not, Itlian, French, Danish or Californian… they seem to really go well with baby greens, drizzle of mild dressing, and a fork. 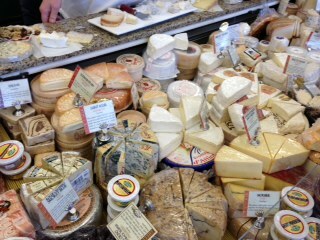 CHEESE at a gourmet or regional fine market like Oliver’s will be vastly better than a super market. I promise. The artistry is here. I promise. 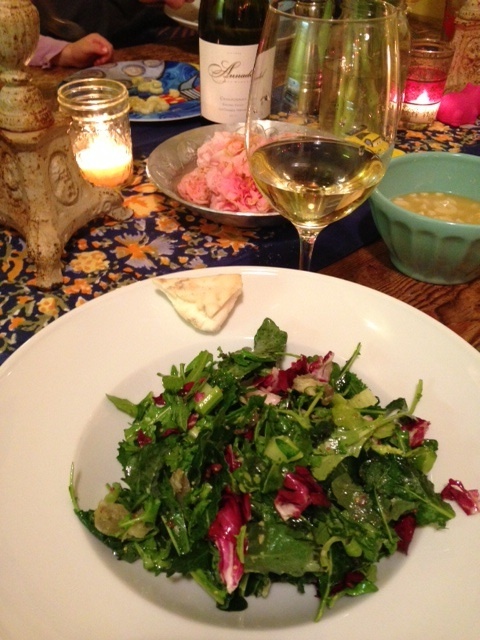 My Food Lesson of the Week is this: Fancy cheese is ridiculously delicious with dark, baby greens. Darker the better. Kale, spinach, arugula, herbs mix, even radicchio, endive and frissee. I’ve used our regular salad dressings (chopped garlic, EVOO, Balsamic and salt), the mustardy one, my white Balsamic dressing too. And they ALL go. The only time great cheeses didn’t pair well was with the whiter parts of a romaine. Blah. This may be totally normal to you and you now think I am an idiot. But I am so happy with these consistently delicious pairings, without the added carbs of crackers, that I had to share… Happy eating! Starting out? Ask for advice or opt for an Espoisses. But let your gourmet cheesemonger ask you what you like and go from there. This entry was posted in Entrees, Salads, Uncategorized by Abigail. Bookmark the permalink.